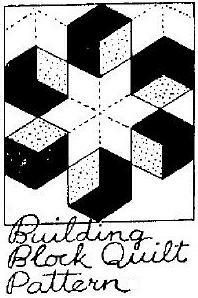 Nancy Page was a byline for household and quilt pattern features by Florence La Ganke Harris, a Cleveland, Ohio, home economist, distributed through Publishers Syndicate, 30 North LaSalle Street, Chicago, Illinois. Florence M. La Ganke was born May 2, 1886, daughter of Robert F. and Lily J. (Green) La Ganke of Cleveland, Cuyahoga County, Ohio. She married Fred Harris about 1923 (some believe that Florence first married a Mr. Poor but evidence has not been discovered). 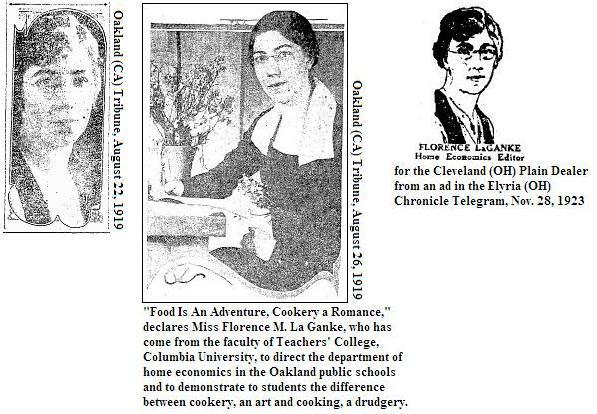 Miss Florence M. La Ganke, instructor in the foods and cookery department of the Columbia University, New York City, has been elected by the Oakland board of education as the new director of the home economics department in the Oakland public schools. Superintendent of Schools Fred M. Hunter, during his recent visit to New York City, discovered Miss La Ganke teaching during the summer session at teachers' college of Columbia university and succeeded in persuading her to accept the directorship and supervision of the home economics, domestic art and science departments of the Oakland schools. Miss La Ganke has been dietitian of large hospitals, has directed immense school cafeterias, has managed university dining rooms and has a broad experience in organization of schools, outlining courses and in teaching all of the subjects included in the home economics work of a large school system. Miss Florence M. La Ganke is a native of Ohio. Her early education was obtained in the public schools of Cleveland. After a tour of Europe, Miss La Ganke entered upon her study of home economics at Pratt Institute, but at the conclusion of her first year's work she decided to complete her training at teachers' college. As dietitian of St. Luke's hospital, Cleveland, Miss La Ganke received her first experience in practical home economics work. Following her two years at St. Luke's, she was invited to return to New York to take charge of the Horace Mann cafeteria, a work sufficiently onerous in itself, since it involved the preparation of seven hundred and fifty meals per day. Miss La Ganke's propensity for big undertakings, however, admitted of her taking charge of the Whittier Hall dining room during the summer session of 1913. It was a fitting endorsement of Miss La Ganke's service at Horace Mann and Whittier Hall in New York City that she was offered the instructorship in home economics at the college for women, Western Reserve University, Cleveland. In this capacity Miss La Ganke did the pioneer work in organizing classes, installing a students' cafeteria, college tea room, and ultimately conducting the dining room of the Flora Mather House dormitory. As a purely philanthropic venture, Miss La Ganke undertook to transmute into first class chefs a group of boys in a night class of one of Cleveland's settlement houses. During the past year and a half Miss La Ganke has been at teachers' college, Columbia University, New York City. She has responded to the appeal of the foods and cookery and also the household administration department by conducting classes in institutional management, marketing and large quantity cookery. For reasons that weren't fully explained in the Oakland newspapers, Florence apparently ruffled a few feathers, accused of "'spreading propaganda against the economy and efficiency program of the school department.'" She had the full support of the State Home Economics Association, Bay section, that adopted resolutions to that effect. Although the charges never came to fruition, she returned to Cleveland in 1922 but not before being honored with a tea given by the women members of the supervisory department of the Oakland public schools. * Ann Kerven's identity has not been discovered. Did she illustrate the Nancy Page features through the years? We don't yet know the answer. The household column inaugurated a Tuesday Quilt Club in May 1932. The announcement appeared in the May 16, 1932, column. From the Lowell (MA) Sun: Tomorrow, Nancy Page will present to her quilt club one of her beautiful and distinctive quilt patterns. Nancy Page Starts a Mid Week Pieced Quilt Club. The column's text explained: Nancy Page's quilt club members were jubilant. She had promised to give them patterns for pieced quilts as well as appliqued ones. And better still, she said she would open her house one day a week, Tuesday, for the club meeting. Imagine the excitement when the club met for the first time. . . .
Newspapers were not always faithful to the release date supplied by the syndicate for each Nancy Page installment so dates can vary by days, even months. Some newspapers that carried the household column skipped the Tuesday episode altogether which would have been rather puzzling for the feature's readers because the next day's quilt club meeting was sometimes mentioned in Monday's column. Syndicated features can be confusing to sort through for accurate dates, but with the aid of NewspaperArchive.com and the online perpetual calendar (http://www.wiskit.com/calendar.html), the correct release dates can be determined for nearly all the Tuesday Quilt Club patterns through 1939. The Tuesday patterns continued into 1943 or 1944 but the exact year is not known. Editor & Publisher discontinued its Annual Syndicate Directory supplement for two years during World War II due to the paper shortage and when it returned the Nancy Page feature was no longer listed by Publishers Syndicate. A weekly, three-column feature introduced in or about January 1929, titled variously as the "Nancy Page Club" and the "Nancy Page Quilt Club," presented self-contained designs for series quilts. During its early years, the feature also presented many general needlework designs and several individual quilt patterns. Twenty-one series in this format have been documented. The first one was Grandmother's Garden in 1929 and the last was Hearts and Flowers in 1938. (One more series, Mother Goose, was published in 1938-39 as part of the one-column Tuesday Quilt Club.) Several non-quilt series were also published and one of these, Noah's Ark Wall Hanging in 1929, could easily be adapted to a quilt. 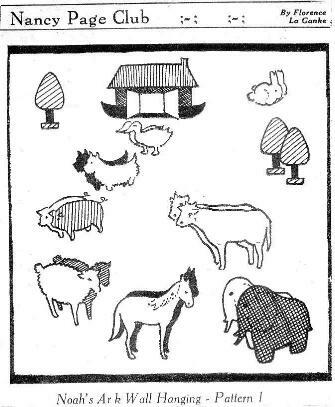 Although not all newspapers carried it, the Minneapolis (MN) Tribune ran Noah's Ark immediately following the Grandmother's Garden series. Both Nancy Page features--the daily one-column household feature and the larger 3-column weekly feature--were rechristened Jane Page by at least one newspaper, the Council Bluffs (IA) Nonpareil, and the Louisville (KY) Herald-Post omitted the Nancy Page name altogether as well as all references to Nancy in the text. In addition to her Nancy Page columns (which would keep most of us fully occupied), Mrs. Harris did personal appearances, judged quilt contests including the second Storrowton Village, Massachusetts, contest in 1933, was (in 1937) home economics editor of the Cleveland Plain Dealer, instructor in cooking at Flora Stone Mather College, instructor of nutrition at Cleveland College, and authored or co-authored a lengthy list of cookbooks and home economics books, 1929-1964. She's the author of "Spreading Beauty" in Successful Farming, December 1935; "The Calico Tree" in Country Gentleman, January 1939; "Our Blue Ribbon Quilt" in Country Gentleman, February 1940, and "Points for Fine Quilting," magazine and date unknown. Mrs. Harris, a widow, died February 27, 1972, in a long term care facility in Cleveland Heights, Cuyahoga County, Ohio (Ancestry.com).